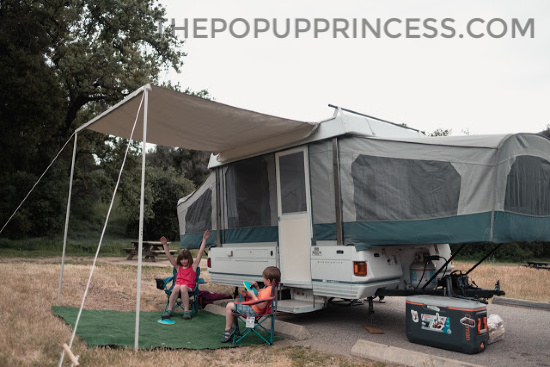 Remodeling and traveling in a pop up camper is a great way to bring the family closer together. It gives families the opportunity to disconnect from technology and reconnect with each other. Ashley and Graham took their first camping trip when their youngest was about six months old. It was a game changer for them. The slow pace, the sense of togetherness, and the permission to unplug captured their hearts in such a special way. Over the next three years, they tent camped all over the place. As their kiddos grew up, they set their sights on a pop up camper. Since Ashley and Graham were on a budget, they knew they’d need to look for a used camper. That meant some renovation work was in their future, which honestly made them all the more excited. They realized it would allow them to put their personal style into every inch of the pop up camper. After a bit of searching on Craigslist, they found their camper. They named her Poppy and got right to work. 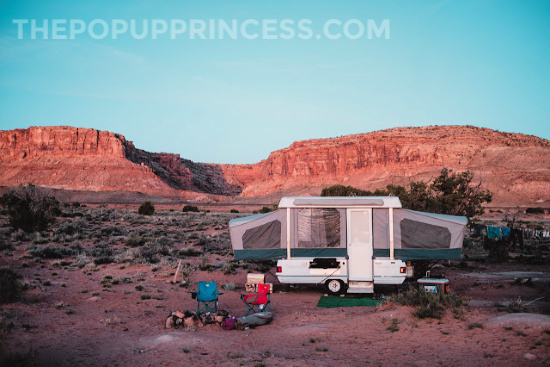 If a used pop up camper is in the stars for you, make sure to check out our guide here for helpful tips on finding the right PUP for your family. The first thing they did once they brought Poppy home was a complete deep clean of the exterior and interior. It is much easier to see what actually needs to be done when you take stock of your camper, and a thorough deep clean is a great way to do that. Then the Scobeys mapped out their renovation schedule so that Poppy would be ready for a California road trip they had planned for a few weeks later. Of course, there are always things that can derail your progress, but setting up a renovation schedule can ensure that your makeover project doesn’t drag on for months. First on the schedule? Painting the cabinets! I actually recommend this as a first step myself. If you are laying new flooring, it is a good idea to get the painting out of the way first. That way you don’t have to worry about taping off a brand new floor. 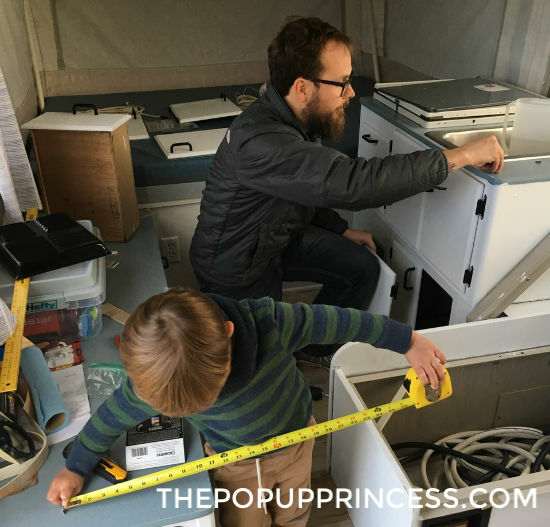 Ashley and Graham removed the cabinets from the camper and painted them a fresh white color. The hardware got a couple of coats of glossy black spray paint. 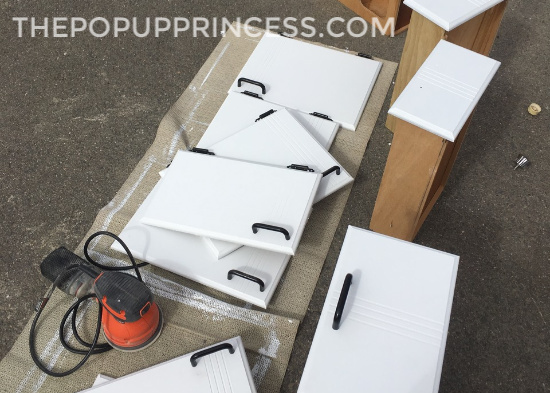 Using the original hardware is another great way to save money, and something as simple as a coat of paint can give those pulls and knobs a whole new look. Need tips on painting your cabinets? Check out our tutorial here. 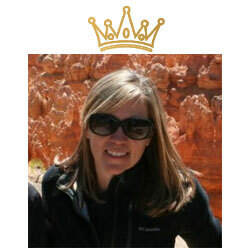 Next on the agenda was what Ashley deemed the most difficult part of the whole renovation–the flooring. The Scobeys opted to cut one piece of sheet linoleum for the whole floor, which took a LOT of measuring, calculating, and finagling. The whole family got involved. 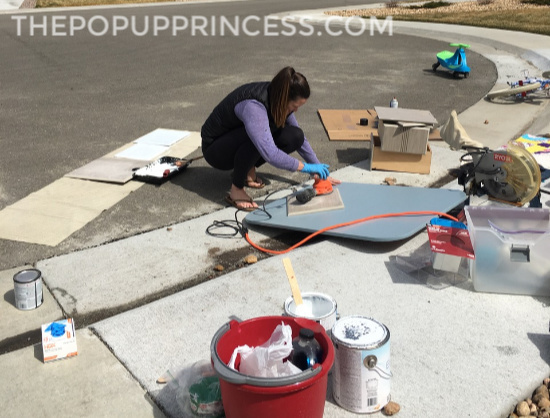 😉 Ashley says that next time they take on a flooring project, they will definitely opt to lay floors that come in peel-and-stick panels. This would have been a LOT easier, in her opinon. The final item on the agenda was fabrics. 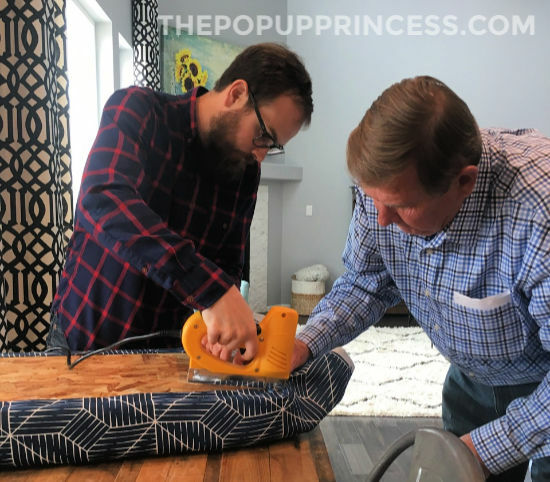 Ashley and Graham used the wrap and staple method to cover their existing cushions in a beautiful blue geometric print. They used the existing drapery panels as a pattern and constructed new curtains as well. And using the original curtain tabs meant the drapes hung perfectly on the tracks. It’s budget friendly, too. The splurge came when they purchased Beddy’s bedding for the bunks. 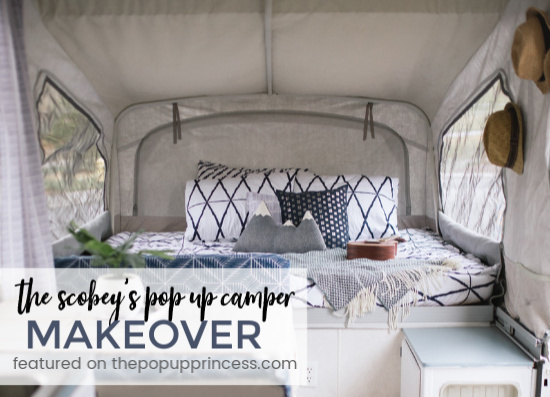 It is one of Ashley’s favorite things about the remodel, and it makes keeping the camper clean with two kids so much easier. In order to make Poppy feel like home, the Scobeys decorated her in a style very similar to their house. They used lots of bright whites, wood accents, and some greenery to give her a modern facelift. She’s like a part of the family now, and the Scobey kids would rather sleep in the camper than in their own beds. Who wouldn’t? That camper looks so cozy! I’d love to spend a night cuddled up there as well. 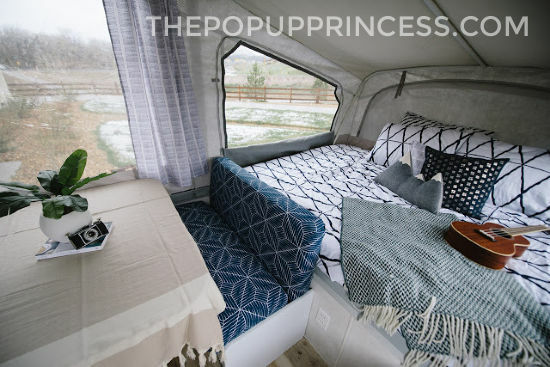 For ideas on how to cozy up your pop up camper, be sure to read our tips and tricks here. 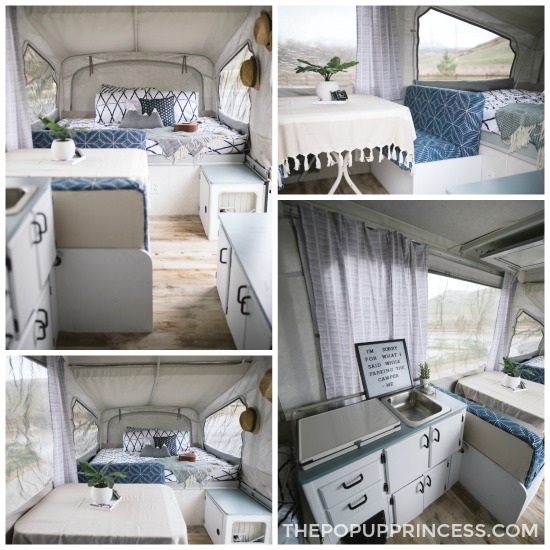 Ashley says renovating the camper required a lot of hard work and a flexible, can-do attitude, but they love Poppy to pieces and are excited to take her on many adventures. You can check out some of The Scobey’s family adventures on their blog here. What a perfect way to bring the family all together, Ashley! Thanks so much for sharing your makeover with us. Beautiful! I know you said the floors were a lot of work but they look amazing. Great choice on colors, too! Regarding Beddys, can you tell me what sizes you purchased? Full and queen, or is it different for the PUP?